Last April, the Obama administration announced that the “United States will not use or threaten to use nuclear weapons against non-nuclear states that are party to the Nuclear Non-Proliferation Treaty (NPT) and in compliance with their nuclear non-proliferation obligations.” This declaration appeared to sharply constrain the conditions under which any U.S. leader would consider using nuclear weapons. After all, most of the world is made up of non-nuclear states in good standing with the NPT, meaning that there is a very small list of potential targets to attack. Moreover, the administration went further by declaring that the fundamental purpose of nuclear weapons was deterrence and that such weapons were reserved for “extreme circumstances to defend the vital interests of the United States or its allies and partners” (quoted in Gerson, 7-8). By perhaps it did not go far enough. According to Michael Gerson, the administration missed an opportunity to take a bolder step in the direction of durable arms control and international stability. Gerson argues that the administration should have adopted a strict no first use (NFU) policy, which would have included “a presidential declaration that the United States will not be the first to use nuclear weapons in conflict, and that the sole purpose of U.S. nuclear weapons is to deter – and, if necessary, respond – to the use of nuclear weapons against the United States and its allies and partners” (9). The inclusion of the phrase “sole purpose” would be especially important because the current formulation “deliberately leaves open the option for the United States to use nuclear weapons to launch a preemptive – or, less likely, a preventive – first strike against Chinese, North Korean, Russian, and (perhaps) future Iranian nuclear forces” (8). Keeping the nuclear option on the table may lead to dangerous instability in future crises. Modern U.S. nuclear weapons are so accurate that other states might reasonably fear a disarming first strike, and their fear of preemption may compel them to strike first instead. U.S. leaders may in turn exaggerate the risk-acceptance of emerging nuclear powers, which could lead Washington to act rashly in a crisis. The upshot is a contemporary version of Thomas Schelling’s concept of the reciprocal fear of surprise attack: “He thinks we think he thinks we think… he thinks we think he’ll attack; so he thinks we shall; so he will; so we must.” Gerson argues that the easiest way to break this dangerous cycle – or, better yet, stop it from starting – is to change the language of U.S. declaratory policy. The article begins by addressing four common objections to such a change. First, critics of NFU believe that nuclear threats are useful for deterring conventional aggression from nuclear-armed regional powers. Gerson notes, however, that conventional deterrent threats are more credible against this kind of behavior, while nuclear threats are disproportionate and unlikely to be believed. Overwhelming U.S. advantages in military capabilities also argue for conventional deterrence in these cases. Critics similarly claim that the first use option may help deter chemical and biological attacks, pointing to the example of the first Gulf War, when thinly veiled nuclear threats apparently convinced Saddam Hussein to keep his arsenal of poisons and pathogens on the shelf. But the first Bush administration also made explicit threats of regime change to Saddam, and these may have been more important than the somewhat ambiguous nuclear signals. Moreover, the credibility of nuclear deterrence against chemical and biological attacks declined after the war because key administration officials admitted that they never intended to follow through on their nuclear threats. Third, some analysts argue that U.S. policymakers need the option of preemption to guarantee the destruction of rival nuclear forces. Gerson argues that successful preemption would require near-perfect intelligence to achieve a disarming first strike, but this level of accuracy is still illusory, despite important advances in collection technology. And in the unlikely event that the United States actually found itself in possession of such pristine intelligence, conventional weapons would suffice. A fourth and related claim is that nuclear weapons are necessary in order to successfully target hardened and deeply buried targets. Gerson counters that high precision conventional munitions are sufficient, especially if they are delivered in sequence on the same target. Having effectively dispensed with these criticisms of NFU, Gerson turns to explaining why it would enhance crisis stability and reduce the likelihood of nuclear use. Removing the first use option, he writes, would reduce others’ fear during intense confrontations and lower the chance of accidental use or inadvertent escalation. It would also lead to more stability in general because it would clarify U.S. strategy and encourage leaders to focus on conventional military capabilities rather than dubious nuclear options. Other states would be less alarmed at U.S. nuclear spending if they believed that the United States was only interested in maintaining its ability to deter nuclear attacks. Finally, a formal NFU declaration might encourage other nuclear powers to revisit their own doctrines and re-energize arms control negotiations. Gerson makes good use of classic deterrence theory, and he provides a powerful and persuasive argument about the importance of sharply constraining the roles of nuclear weapons (more on this below). However, he probably overstates the benefits of NFU for reducing the chance of escalation during crises. If the United States found itself in a serious crisis with a nuclear-armed rival, it is unlikely that the adversary would be reassured by official U.S. declaratory policy. A great deal of mistrust, hostility, and fear would have to be present for one or both sides to actually consider using nuclear weapons, and attempts to control escalation by pointing to legal restrictions like NFU would stretch credulity. Rather than being assuaged by the no-first use pledge, adversaries might view it as nothing more than cheap talk. In extreme cases they might even suspect NFU as being part of a deception campaign designed to lull them into a false sense of security. Gerson anticipates this criticism by drawing on recent work in political science on the theory of audience costs, which posits that threats and promises are more credible if everyone knows that leaders will pay a heavy political price for reneging on their commitments. In this case, he writes, a U.S. president who pledges to uphold NFU would be vulnerable to his domestic rivals if he reverses course, especially if they can point to the president’s apparent recklessness in order to win over moderate and independent voters. The United States would also pay an enormous international price, undermining faith in bilateral and multilateral agreements and U.S. commitments in general. The domestic and international audience costs of violating NFU would be substantial. This argument is not entirely convincing. To be sure, audience costs might inject a much-needed dose of sobriety in Washington, but they will only reduce instability if foreign adversaries believe that American official care more about those costs than about the issues that led to the crisis in the first place. If core security interests are at stake, then we may reasonably expect that the closer a crisis approaches the nuclear threshold, the less likely those domestic political costs will matter. 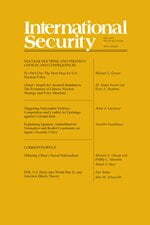 More generally, while scholars have shown than domestic audience costs may constrain policymakers in some circumstances, it is still far from clear that they are effective ways of generating international credibility, and there is little empirical research to support the idea that audience costs increase the credibility of signals during periods of high crisis. This proposition requires much more scrutiny. To his credit, Gerson suggests the limits of his argument when he notes that during crises, U.S. leaders would need to “repeat and reinforce the commitment to NFU.” They would also need to calibrate public statements with tangible signs of U.S. intentions, such as changes to the alert status of nuclear forces, in order to convince adversaries that their promises were genuine. Standing declaratory policy will not do much to reduce crisis instability without these additional measures. In fact, as Gerson notes, it might actually make things worse if adversaries come to believe that NFU is part of a deception operation in advance of a first strike (46). Gerson is on firmer ground when he writes about the importance of devaluing the utility of nuclear weapons. Emerging nuclear powers tend to harbor serious illusions about what they can achieve with their newly won arsenals, and efforts to disabuse them of these illusions are all for the good. If such efforts succeed, new nuclear states may not feel the need to rapidly build large arsenals, which would increase the risk of inadvertent escalation, accidents, or the loss of nuclear material. Devaluing nuclear weapons will also discourage states from using of nuclear weapons as cover for conventional aggression, while encouraging them to participate in arms control negotiations. The world will be a safer place when more states come to view nuclear weapons as good for existential deterrence and not much else. Ironically, however, a presidential NFU declaration might stand in the way of this goal. The Obama administration’s current package of “negative security assurances” amounts to a de facto NFU pledge to almost every country in the world, and Democrats and Republicans appear to be comfortable with this formulation. But if the president publicly declared a categorical NFU policy, hawks would doubtless jump on the issue, polarizing the debate and creating an opportunity for critics to attack the president as soft on national security. Nuclear declaratory policy might also become a litmus test for candidates seeking to establish their national security credentials. The perverse outcome would be increased calls for keeping nuclear weapons on the table to deal with a host of threats – real or imagined. Thus, rather than persuading world opinion that the United States is serious about devaluing the role of nuclear weapons, the domestic fallout from a presidential announcement might cause international observers to draw the opposite conclusion. Joshua Rovner is Assistant Professor of Strategy and Policy at the U.S. Naval War College, and Adjunct Assistant Professor in the School of International and Public Affairs at Columbia University. Dr. Rovner is also reviews editor for the Journal of Strategic Studies. His recent publications include Fixing the Facts: National Security and the Politics of Intelligence (Cornell University Press, forthcoming); and “After Proliferation: Deterrence Theory and Emerging Nuclear Powers,” in Toshi Yoshihara and James R. Holmes, eds., Nuclear Strategy in the Second Nuclear Age (Georgetown University Press, forthcoming). Thomas C. Schelling, The Strategy of Conflict, rev. ed. (Cambridge, MA: Harvard University Press, 1980), p. 207. Not all analysts agree. Compare Charles L. Glaser and Steve Fetter, “Counterforce Revisited: Assessing the Nuclear Posture Review’s New Missions,” International Security, Vol. 30, No. 2 (Fall 2005), pp. 84-126; and Keir A. Lieber and Daryl G. Press, “The Nukes We Need: Preserving the American Deterrent,” Foreign Affairs, Vol. 88, No. 6 (November-December 2009), pp. 39-51. See also the technical appendix to Lieber and Press’s article, available at www.dartmouth.edu/~dpress . For recent work on audience costs, see Michael Tomz, “Domestic Audience Costs in International Relations: An Experimental Approach,” International Organization, Vol. 61, No. 4 (Fall 2007), pp. 821-840; and Jon Western, Selling Intervention: the Presidency, the Media, and the American Public (Baltimore, MD: Johns Hopkins University Press, 2005).